Before beginning, I am anxious to thank you for your tutorials. 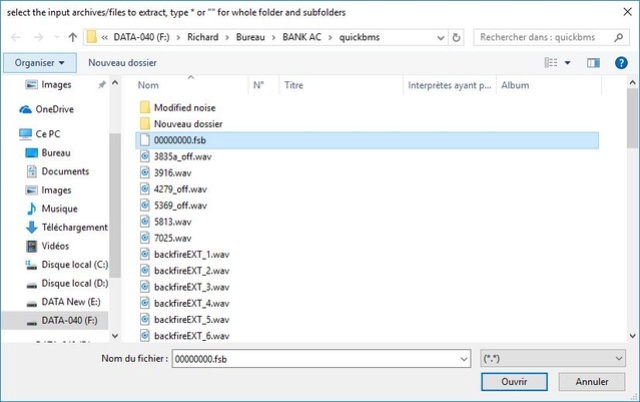 I wanted to extract the audio files wav which are in the audio files bank in Assetto Corsa, to edit the sound when the engine arrives at the contact breaker. I managed to extract files wav from the file bank. I puts you the video. On the other hand, I did not manage to compile the file wav in the file bank. I made a video in 2 stages which correspond to the stages to extract files, but that never works. Everything was correct on the quickbms side, one file correctly reimported. I mean have you reimported the edited wav file in the fsb archive? I do not if I modified 00000000.fsb. I do not speak English, but I am going to try to tell you what I'm doing, so that you can tell me or I make an error. I'm not going to tell you how to re-inject the files, because I do not know what to do exactly. When I run "reimport.bat" I have to choose the file imsa_jaguar_xjr12.bank, or the file 00000000.fsb ? A CMD window opens and I see that 1 file has been reinjected successfully. If you don't update the fsb archive then what you reimport is exactly the same original file. 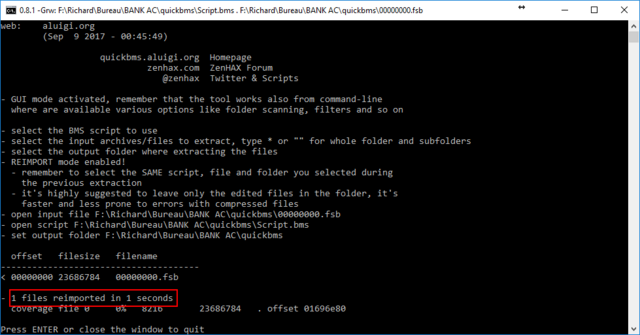 There is no reason for you to use fsb_aud_ext, that tool is necessary only for fsb5 archives that contain ogg data. Use fsbext to do the job and you will be even able to reinject the edited file in the archive since, luckily for you, the files are just pcm16 wav. 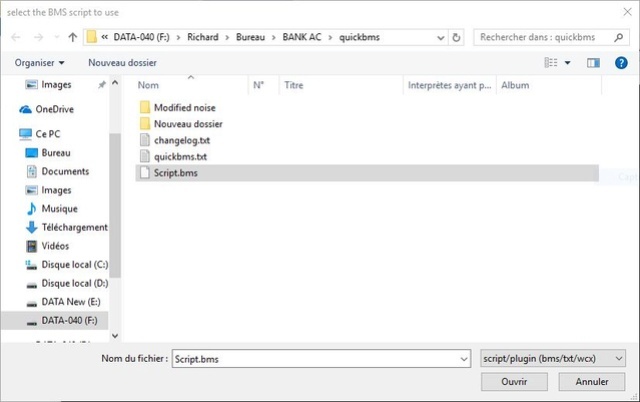 I suggest you to use the official FMOD soundbank tool for rebuilding the fsb archive, otherwise you can rely on fsbext but I'm not sure if it works properly. Long story short, you are OT here because it's not related to quickbms reimporting, post in the Audio section regarding FSB editing/reimporting in case you still have problems. Is it possible to reimport into files larger than 4gb? I'm trying to reimport a 90kb file, but with quickbms it just hangs, (I know, it's not supported for over 4gb), with quickbms_4gb it just shows 0 files reimported, and no error messages. The game is Blade & Bones, and UE4 game. If you get the "0 files reimported" it means you did something wrong. If you used it correctly and quickbms gives you errors (about compression, memory_files and so on), then there is no solution. I'm having trouble repacking bank files. 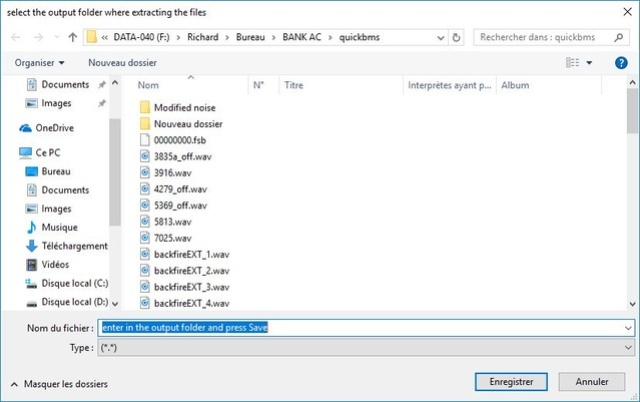 The bank contains the same number of files as originally, and all of the replaced ones are smaller than the original ones. Here are the files, in case you need them: The original PAK file (6GB), the original bank file (208MB), and the modified bank file (203MB). Because it's a chunk based format in which parts of 65536 bytes are read from the file and compressed. If the entropy of one of these chunks is bigger than the original chunk, it can't be compressed more than before and it can't be reimported (even if you use reimport2 since they are sequential chunks). So, I guess whether this works then is sort of random (i.e. depending on whatever happens to end up in those chunks)? After all, the 2MB bank worked just fine, and its chunks should've been bigger than 65K as well. Or am I misunderstanding something about the process (very likely)? Anything "desperate" I could try, (e.g. dumping some files, reducing file sizes, etc.)? Or is that pretty much the end of the road for me? You can have 99% of the importing file with an entropy equal or lower than the original and 1% that is higher and can't be compressed as before. I want to delete videos of .pak files, so I made 0B files of the videos with the same names, and tried to import them, and that fails with reimport1 and 2. Any help will be appreciated. I don't see any problem with that 0-bytes file reimporting method, what's the error you get?